Must be spring in Texas. 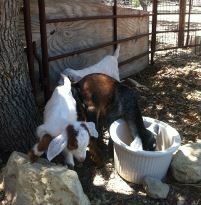 Our goat, Dixie, had triplets. Donald, Daffy and Daisy are the cutest babies. Dixie has been a good mom except she keeps losing her babies in the pasture. Alicia and I were out until 9:30 one night finding Daisy and two days later Dixie lost Donald and Daffy. This time I decided that Dixie needed to help in the search. First we had to do a crash course in leading since Dixie did not want to leave her buddies at the barn. Natural horsemanship techniques seem to work as well on goats. I would hold pressure on the lead rope until Dixie thought about coming forward then I would release. She picked this up quickly. Every now and then Dixie would take a shot at blasting past me and rolling her hind end around worked great to curb that behavior. After about an hour of walking the pasture with Dixie bawling her head off, we found the kids. I was thrilled but Dixie, not so much. I wanted her to stand for the hungry babies to nurse and she wanted to go back to the barn. I finally put a choke hold on her and the kids got a quick drink. Alicia and I have been working hard on our garden. We have bought some fruit trees and realized that we did not have near enough space in the front yard to plant them. We decided we needed an orchid area and this required a new fence. At the rate of 2 post holes a week this turned into a 3 week project. The fence is finally done and we are ready to plant the trees. Just when we were starting to get some blooms going on the vegetable plants the hailstorm hit. Golfball sized hail and plants do not go together at all. After the worst of the storm passed we went out to assess damage. First we made sure all the horses were fine. Cerise must have panicked and left her shelter for the trees which meant that Tess, my 32 year old mule, ran around the house and down the hill to look for her. Once we found them, we brought Tess back up and put her in with Cerise in case we had further bad weather. No windows were smashed so that was wonderful, but the garden plants took a major hit. Anything with a wide leaf suffered the most. Most of the stalks are still intact so we will see what can recover and what will need replanting. The trees were still in pots up close to the house; so glad we had not planted them. This morning the ground is solid green from all the down leaves. I hope the deer will be able to eat them so some good comes from the hail. We did get some much needed rain. This morning we had another round of thunderstorms and now it is clear and beautiful. Yep, it is spring in Texas.